Upres is for designing tunnels and pipe lining using Dr. H. Einstein's method ("Improved Design of Tunnel Supports, " prepared for the U. S. Department of Transportation, 1980). 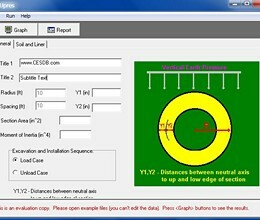 Tunnel can calculate the stress redistribution in soil, the moment, the thrust, and the deflection in pipe or tunnel. Full slip (friction between soil and structure) or no slip conditions are considered. Moment and thrust diagrams can be viewed and printed. Upres is suitable for most elastic closed form models such as pipe and circular tunnel lines buried underground. The structural materials can be concrete, wood, shotcrete, brick, and steel. The structure can be built by segment panels, an I-beam and lagging system, or a continuous circular system. Even though the program is an elastic solution, the results match very well with a solution of Finite Element Analysis, which requires complicated inputs and calculations. * Upres download link provides demo version of the software. Software for liquefaction analysis, Software for settlement analysis by liquefaction: Liquefaction of saturated soils (silt, sand, and gravel) during earthquakes has caused severe damage to buildings, earth embankments, dams, and bridges. Heave determines the stability of a vertical cut excavation in soft soils. Multiple layers, different water tables, and surcharge loads are taken into account. HCALC solves for head loss, diameter, flow, pipe area, velocity, Reynolds number and friction factor using the Darcy-Weisbach, Hazen-Williams or Manning's equations. 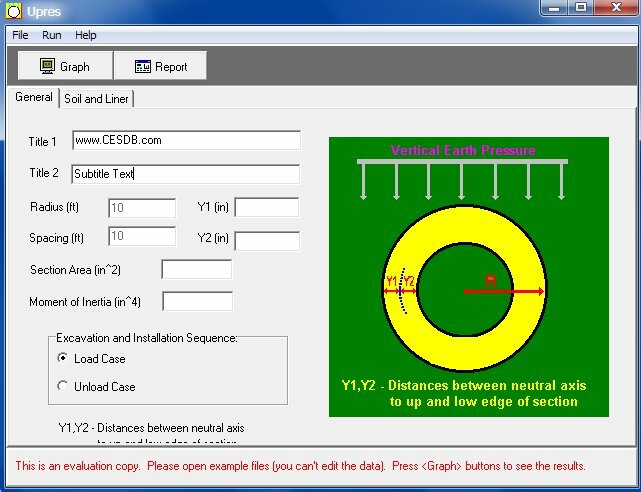 Shoring Suite is a software package that contains 4 Modules: Shoring, EarthPres, Surcharge, and Heave. These modules are sophisticated design and analysis tools developed by experienced engineers and professors. Upres has been rated 5.0 out of 5 points. A total of 1 votes cast and 0 users reviewed the software.